We’re closer to getting our own C-3PO than you can imagine. One day, we will all have robots instead of smartphones. That’s the forecast from some of the top minds in robotics and artificial intelligence who gathered in Pebble Beach, California, last week to debate the future at the G-Summit conference organized by GWC. The group of scientists and researchers celebrated all the latest advances in the field of robotics, even as they acknowledged the limitations of today’s specimens. 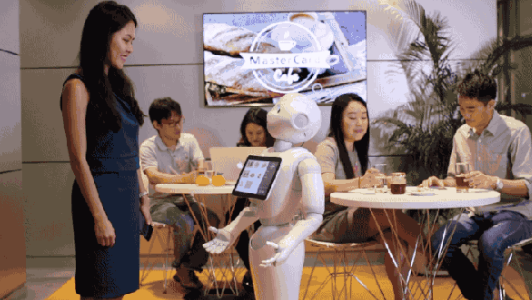 A lot of people want C-3PO — the intelligent and affable droid in the Star Wars films — but if you’re expecting C-3PO today you’ll be disappointed, said Steve Carlin, the chief strategy officer of SoftBank Robotics America, which makes the 4-foot tall, human-shaped “Pepper” robot. Pepper can do some nifty things like recognize different people’s faces and greet customers at Pizza Hut, but it can’t wander around the neighborhood on its own. Similarly, the fearsome mechanical creatures developed by Boston Dynamics can climb stairs and tramp through the snow, but don’t expect to have late-night conversations about the meaning of life with these droids. And the boxy machines developed by Amazon Robotics can glide across warehouse floors, impressively moving merchandise around, but that’s all they can do — they are one-trick ponies. So what makes the leading lights of AI and tech research so certain that we’ll eventually get C-3PO? The answer is in your hands, or rather, in the smartphone that’s in your hands. A smartphone is a combination of different technologies, all of which evolved separately and according to their own timelines. Eventually all the technologies matured to a sophisticated enough stage and it was possible to merge them together. That’s when the smartphone was born. A robot is no different. It’s essentially an embodiment of various very complex technologies including speech recognition, visual computing and mechanical engineering, among other things. When each one of these components attains sufficient maturity, they can be combined to create a “universal” robot akin to C-3PO, said Dmitry Grishin, who cofounded Russian internet company Mail.Ru and is now the CEO of Grishin Robotics. The first radio transmitter was created in 1887. The first commercial photographic camera was produced in 1839. The first cathode ray tube, the precursor to today’s digital display, was created in 1897. The first integrated circuit dates back to 1949. Of course, there are lots of other components required to make a smartphone. But as you can see, it took more than 100 years from the advent of some of the first key technologies needed for a smartphone until we arrived at the 2007 introduction of the iPhone. Does that mean we’re still 100 years away from the robots of science fiction? Not necessarily. Tech development has accelerated at an exponential pace and gathers momentum with each new innovation. The good news is, your all-purpose, super-intelligent C-3PO robot is coming. But don’t throw away your smartphone just yet.